THIS!!! "Pushing our limits is an experiment. Finding the perfect balance is part of the process. It’s a thin line between agony and glory. And we won’t know which side of the line we’re on until race day." 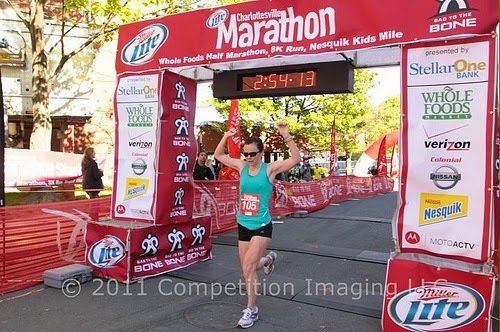 I'm a 48 year old female Masters marathoner, age grouper, who's BQ'd and PR'd in both the marathons I've run this year - Shamrock in March (3:49:25, 5:35 faster than BQ) and Baystate two weeks ago (3:42:47, 12:13 faster than BQ). I'm only about half as nuts as I sound below. DH thinks I could do better at Richmond than at Baystate, suggested I go out w/ a faster pace group & see how it felt, see how long I could hold it. If I feel good, maybe I do better. If I'm not feeling it, drop back & finish. And my chiro agrees w/ him! Says I should use all races between now & Boston as learning experiences & experiments, physically & mentally learn about myself, my fitness, etc. (and I've been reading a book called Older, Faster, Stronger where the woman used a similar strategy to good results). Chiro also said to DH that I "don't know how flippin' fast" I can be. I've never used races as training before. DH has always had more confidence than I have in my abilities, and so far, he's been proven right. I've been able to do things I thought were only dreams, and I'm dreaming bigger (well, faster) now. Why NOT go for it, being willing to pull the plug at the first sign of any physical discomfort that might cause me problems in maintaining consistent, healthy training for Boston? I don't have any experience running two marathons this close together, so I can't tell if my recovery will be good enough for me to try for speed or not. I guess the bod will be the final decision-maker...if it won't play, it ain't happening. Thoughts, ideas - from someone fast and close to elite like you who has raced many more times? I still think of myself as a runner, not a racer as I'm only ever competing with myself. (so impressed with your progress over the years!) Any tips, etc. much appreciated. Thanks for listening anyway. I hope you have a terrific half this weekend! Now about your questions: I went back and forth on this as well and chatted with some teammates about it, too. (Hope that’s okay!) I’m all for going big and seeing what happens, but the worry is the short time between two hard marathons (just four weeks, right?) I would think it would be really hard to pull off another PR so soon, and you don’t want to be unfairly discouraged. (I.e. You don’t want to look back on Richmond and say, “I went big and couldn’t do it,” if maybe the real problem was lingering fatigue from Baystate.) You also certainly don’t want to compromise training for Boston in any way, and the double effort might not catch up to you until after the race. I’ve also never tried running two marathons so close together, so I’m certainly no expert! But what about trying to run an all out half marathon and seeing what you can do there? You might be able to look to that and estimate what that equates to for a full (although I know it’s not an exact science). Of course, you (and your DH) know your body best, so if Baystate felt more like a training run, than you might surprise yourself! You’ve got the right mindset, to be cautious and pull the plug if necessary, but also make sure your recovery afterwards is top-notch. LOVE this post. I battle the same things quite often - it's such a fine line between pushing yourself and bumping up that top limit and injuring yourself and being out once again. I'm coming back from injury (sfx/reaction in tibia) and I'm so scared to push myself again for fear that I'll re-injure myself in some way yet again. I worked all summer to slllooowly build up my mileage base back into the 70s where I was comfortable, then two weeks into my training...boom. Injured. So I'm cautious. And while I'm targeting a spring marathon now and am once again slowly on my way to building up mileage, I'm very nervous about what it will mean when I'm finally adding back in speed work and tempos and starting to really train hard. I ask myself the same questions - should I do less mileage this season in an attempt to remain injury free? Should I run less intense runs (fewer speed/tempos) since that's what I think may have contributed to the injury (vs. mileage)? And if I do that, will I still be able to achieve the (ambitious) goal I've set for myself? Ugh. It's a constant battle in my mind. 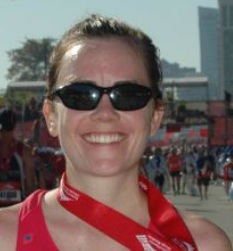 In any case, it appears you have figured it out since I saw that you COMPLETELY ROCKED your half marathon with a 1:19!! That's WICKED FAST! I am very much looking forward to reading a race recap on that one if you decide to write and post one!! Huge congrats to you - what a great time and confidence boost!! Thanks, Jenn! I'm glad to hear you're on the way back! 2) At most, I do 2 workouts a week. I used to sometimes do 3, but those days are no more. I either do a track workout (Wednesday) and long marathon pace run (Sunday) or track (Wed) and tempo (Friday). Some weeks are just one, and this week--post half--I have zero workout days. I think the trick is to making the quality days really quality, and cutting yourself some slack on the other days. Obviously, we will always be debating all these questions, but I think those two things have helped me. I am working on a race report, it's coming soon!